Fear doesn’t remove the danger. Embrace it and get on top of your presentations. 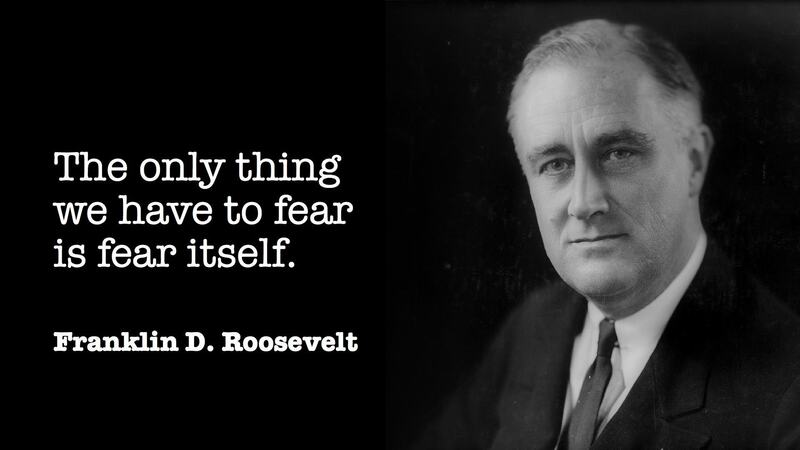 “There is nothing to fear but fear itself” - a memorable line from President Franklin D. Roosevelt’s inaugural address in 1932 at the depths of the Great Depression. At the time he may not have realized it, but his words are among the most powerful pieces of advice for public speaking. After all, what we all fear in presentations is succumbing to fear. Losing our cool, forgetting what needs to be said, not convincing the audience enough. Failing in front of our peers. Doubt, doubt and more doubt. But fear is often generated and worsened by inaction. How many of us do not act when faced by our fears? Fear is a mechanism of the mind to forewarn us, an alarm that lets us know that danger lies ahead and we should do something about it before it’s too late. The science behind fear is well-documented. Many of us have heard of the “fight or flight” instinct. For a speaker, these two extreme actions are manifested by the loss of presence from either shrinking and hiding from an audience (“flight”) or coming out swinging or trying to control them (“fight”). The third extreme reaction is to “freeze” - the presentation equivalent of “playing dead”. The natural balance where you can make a true connection with an audience comes from confidence and relaxation. Some of us are better equipped to deal with fear, while some of us are not stable enough to manage it well. We can all benefit, though, from reducing unnecessary sources of fear that cause stress we can do without. The following 7 steps may not be a cure for everyone, particularly those with deep fears linked to public speaking, but they are a very good start. 1. Master your content - don’t let it master you. There are often parts of a presentation where the speaker does not entirely master what he or she is talking about. These knowledge gaps can be stressful, and trying to explain something that you have not fully mastered will bring a negative feedback loop from the audience as they struggle to understand. Present only what you master, and master everything you present. 2. Rehearse aloud in advance with your slides and timer. Rehearsing aloud is the best thing any speaker can do, but also the rarest. We can spend hours tweaking messages or putting polish on slides, but never enough time on our feet rehearsing. Use a timer so you know exactly how long your presentation takes, and ensure you only take 90% of your allotted time so that on the day you are not stressed about overrunning. If you can meet members of the audience prior to a presentation, this can be hugely beneficial. You must not think like an actor waiting in the wings until the curtain rises. This makes the task harder. Knowing at least some of your audience, and knowing they are not dragons, will reduce your fear and stress. 4. Check that everything works. Technical problems can disrupt a presentation, but even if it all ends up running smoothly, the fear of technical problems can be very destabilizing for a presenter. Many presentations have sunk due to last minute problems with slides, compatibility issues (software and hardware), fonts not downloaded, resolution issues, not having the right adaptor, etc. Solution? Get there early and take the time to ensure all slides and videos look good in real conditions - on the actual computer and actual screen - and you will save yourself a lot of worry, and reduce your stress levels. You should also find the technician in charge of the room. They are your best friend. I once had a technician who saved me from a crashed and locked computer during a presentation in front of a dozen Chinese fashion executives. Don’t rehearse your presentation 101 times. Trust your subconscious mind and leave a little margin for the unknown. You’ll enjoy it more. This should be obvious but many speakers don’t realize how important it is. Don’t drink coffee before presenting, especially if you know you are sensitive to it. Caffeine not only increases your stress levels: it also dries out your mouth and throat, so your voice is less resonant and less powerful. We’ve trained coffee companies and they know this - so should you! 7. Don’t be afraid of being afraid. Now I’m back to the original quotation. If you accept that everyone feels fear when they take the stage, even the greatest speakers, then you can also accept that stress is the body’s way of preparing you to perform at your best. You won’t completely eliminate all stress when presenting, and you would perform worse if you did. These tips will help you to remove unnecessary stress, leaving you with just enough so you can master it, and use it to deliver your best.